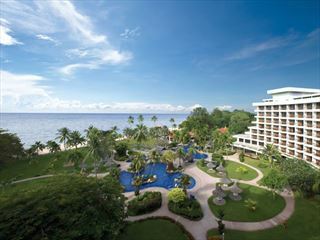 The Hyatt Regency hotel, just three miles north of Kuantan, is set on the a beautiful stretch of sandy beach at Telok Chempedak on the east coast of Malaysia. The hotel, in lush gardens, is designed in traditional kampong style, and all rooms are air conditioned and come with a private balcony. There are 2 aqua violet swimming pools, fitness centre and a sports club. A slightly faded 5 star beach front property with a range of facilities. Gua Charah Caves – these limestone caves are several millions of years old and are 25km northwest of Kuantan. They serve as a meditation retreat for Buddhist Monks and nuns and visitors can visit the huge reclining stone Buddha. Take a visit to the town of Kuantan and experience a river cruise to see the mangrove jungle. Treat yourself to a ‘hawker’ meal at the food stalls behind the Ocean Shopping Mall. Go shopping for handicrafts, jewellery and souvenirs - t his region is renowned for the traditional Pahang crafts of weaving, woodcarving and batik. At Beserah visitors can watch the fishermen use water buffaloes to haul their catch from the shore to a processing area. Kampong Restaurant – serves Eastern and Western cuisine. 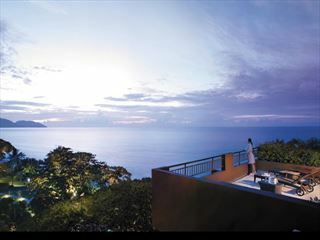 Open for breakfast, lunch and dinner daily and situated on the beach front with a panoramic view of the South China Sea. Italian Bistro –Open Monday thru Saturday and Sunday brunch. Cocco Loco Fun Pub – serves light snacks and drinks. Nightly entertainment provided by a live band except on Sundays.